It was a long season for the Hokies. It was predicted to be another solid, 10-win season, and why shouldn’t we have expected that? That’s how we’ve been playing for a long time. However, after beginning the season ranked in the top 25 as usual, we struggled to hold onto our spot among the nation’s elite teams. It was a less than stellar season, for sure, and our name slowly slipped out of the BCS conversation. Wait, what am I doing here? We all witnessed it. No need to repeat the obvious. What I can do, or at least try to do, is break it down and find some of the highlights and positives of the season, although that seems like a tough task given the outcome. But we’ve got to be optimistic going forward, right? So let’s give this a shot: the good, bad, and ugly of the 2012 Virginia Tech football season. Before I start: I’m not trying to be pessimistic. Really. So if it comes across that way, it’s not my intention. There were just a lot of not-so-fantastic moments in our season this year. After last year, VT lost several strong players to graduation and the NFL, including Danny Coale, Jarrett Boykin, and David Wilson. While we all knew filling their shoes would be a difficult task, I do believe we have the talent to do that. Many of them are freshmen or sophomores, so they have plenty of time to work and develop. Specific names that come to mind are Michael Holmes, J.C. Coleman, Kyshoen Jarrett and Demitri Knowles. Each of these players had some notable moments this season, and I see them becoming big players in future seasons. I was really afraid that we wouldn’t have a whole lot of guys who would be capable of stepping up and filling the holes, especially those of Coale and Wilson. We also have five-star recruit Kendall Fuller coming in next year (and yes, he is the baby brother of Corey and Kyle Fuller). These guys, among others, left me with hope for next year. They will be able to reach their potentials as they play more and gain more experience playing at this level. Another really neat game to witness in Lane this year was VT’s largest comeback in program history. Down 20-0 to Duke at the half, I was starting to get nervous. I couldn’t handle losing to Duke, especially in football where we’re supposed to own them. Something must have clicked during halftime, because we came back and scored 41 consecutive points to claim victory over the Blue Devils. It was great to get that win over Homecoming weekend, especially coming off a 34-48 loss to UNC the week before. Beating Duke is fun, no matter the sport! Oh, and we beat UVA. That counts for something. We all know that games are often decided based on the little things: that one pass that almost toppled out of the receiver’s hands, or that one defender who almost didn’t grab the runner and bring him down. This year’s squad knows all about those little mistakes, all too well. I’m not going to point any fingers, but there were recurring blunders that we can’t ignore. Too many unnecessary fumbles. Countless dropped passes that should have been easily caught. A few crucial interceptions that changed game momentums. Missed blocks. Pass interferences. Predictable plays. Do I need to say a whole lot more? Little mistakes build up to create huge problems in the long run. Another annoying piece of this season was our slow starts to games. I don’t know what it was, but we took forever to get going this year. This was aggravating, and I always felt like I was going to have an aneurism or two before the first quarter was over. I would prefer for my head to not explode at a football game, please. Obviously the little mistakes I mentioned above were not completely chronic, because we came out of the regular season with a 6-6 record. We had moments of absolute brilliance, like that reverse play against Austin Peay (or was it Bowling Green?) or a few of LT3’s epic bomb passes against UNC and UVA. But those moments of brilliance were too few and far between. Inconsistency was our downfall this year. Maybe it had something to do with our players and talent, or the mix of players on the field at any given time. Maybe we should look toward the sidelines. Running plays didn’t work for us this year, so why were running plays still being called? Wherever the issue originated, we have to be more consistent, especially on offense, if we want to be considered an elite team. Sure, all teams make mistakes or have fluke games or what have you, but there is a difference between a fluke and straight-up inconsistency. VT doesn’t go a shaky 6-6 often. It’s not our thing. That has to change next year. Something else that really annoyed me this season was loss of confidence from the fans’ side. Okay, so maybe it was a frustrating season; I’m not denying that by any stretch. But that does not mean that we should stop going to games just because we aren’t dominating. I cannot count how many times I overheard such statements this season: “I’m not going to the game this weekend, we’re probably going to lose.” “I skipped so many games this year. Looks like I made the right decision.” It hurt me to hear things like that, because I still devoted my Saturdays to jumping in North End Zone and losing my voice yelling and cheering for my team. Our team needs and deserves our support, if for no other reason than they are our team. Yes, I know it was tough this year, but that doesn’t mean we should jump ship and lose confidence. That’s not what Hokies do. Okay Kate, step down from your soapbox. You’ve said enough on that. The season isn’t quite over yet. On December 28, the Hokies will take on Rutgers in the Russell Athletic Bowl in Orlando. This is our last chance to prove that we really are better than our 6-6 record shows. I believe we are. While it is not a BCS bowl, we are keeping our bowl streak alive for the 19th straight year. I also believe there are some serious changes that need to be made in several areas during the off-season. But that is another post for another time. For now, I am focusing on the immediate future, and that is the bowl game. I will do a follow-up post once the bowl game has passed. 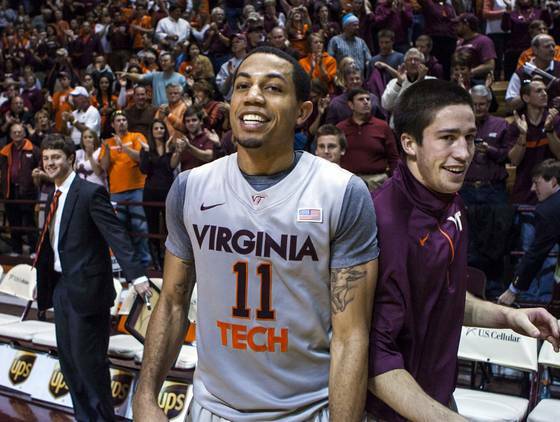 I love my Hokies dearly, and I only wish the best for them. Was this season a fluke? Perhaps. Only time and changes will tell. I am already looking forward to seeing what next season has to bring. We have a whole reserve of talent, and I can’t wait to see how it develops between now and then. But until then, you can bet I will be seated in front of my grandparents’ TV on December 28 (because I will be in Charlotte celebrating Christmas with my family by that time) and cheering as loudly as if I were there. I apologize in advance for that, by the way. Last weekend was definitely one for the books. It was a weekend of celebration, in more than one way! 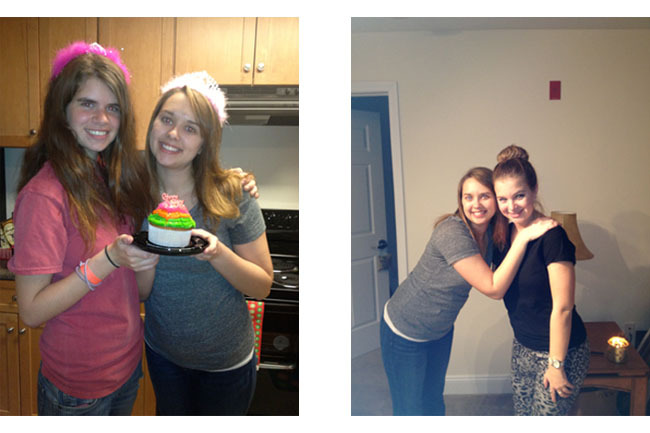 To begin, both my roommate Laura and I turned 21! She turned last Thursday, and I turned on Friday. Perfect timing for us! On her day, she got to celebrate with her sorority sisters at their semi-formal, while I stayed in and watched my favorite Disney/Pixar film ‘Brave’ with a friend (fantastic film, by the way. Did you read my review of it? You should). On my actual birthday, I went to a nice dinner with my friend Jordan at a local brewhaus called Bull & Bones. It wasn’t super fancy, but compared to what college kids usually eat, it was like dining royalty. 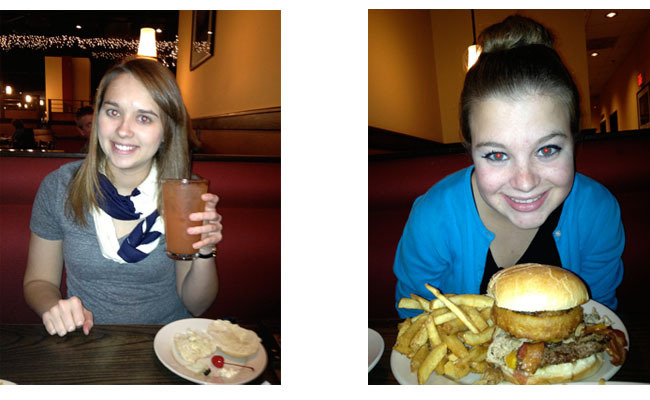 We enjoyed our burgers–which were massive and delicious–and I ordered my first legal drink, a “Southern Belle,” which was a heavenly mix of orange juice, cranberry juice, Captain Morgan’s, and peach schnapps. Mmmm. I’ll have to remember that one for another special occasion. Last Friday and Saturday had to be two of the greatest days of the semester. It was so great to celebrate my and Laura’s birthdays with some of our best and closest friends, fantastic food, and a classy glass of white wine! I could not have asked for a better birthday weekend. Another great part of my birthday weekend was seeing my Hokies play some of their best basketball I’ve seen in my time in Blacksburg. 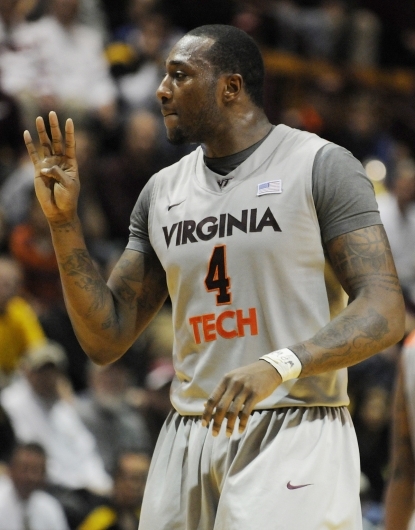 Last Saturday, the Hokies played Oklahoma State in Cassell Coliseum, and I have to say, that was the greatest Hokie basketball game I’ve ever seen (in person, the 2011 Duke game was incredible, but I had to watch it on TV, sadly). As I’ve said before, going into the season, I really had no idea what to expect. With the coaching changes and player transfers, anything could have happened. My friend Kevin and I bought season tickets anyway, because we’re basketball freaks–at least I am–and we just love going to games. Thus far, we have not been disappointed in our purchases. 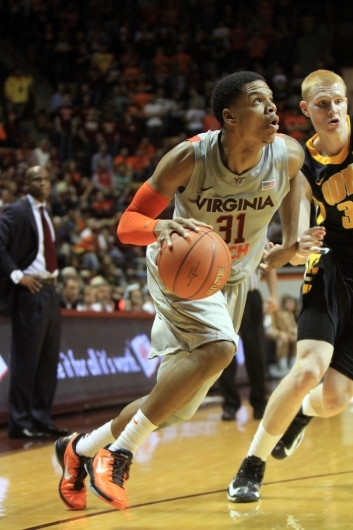 The Hokies started the season 6-0 for the first time since 1982. We knocked off Iowa in the ACC/Big Ten Challenge, 95-79, which I’m pretty sure was the ACC’s first win in the series. Then we beat Oklahoma State at home, 81-71. 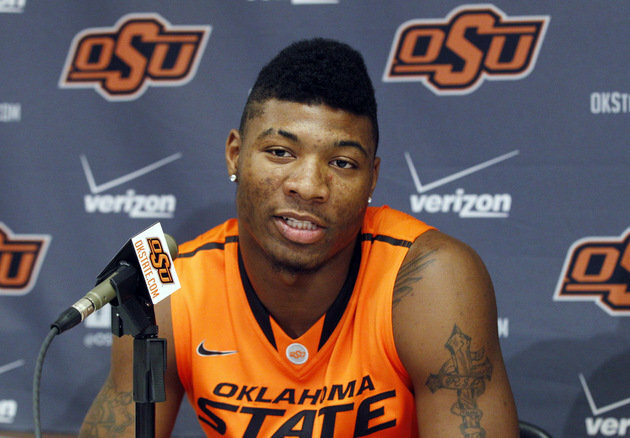 Did I mention Oklahoma State was ranked #15 in the country when we beat them? Well, they were. So what’s working with the Hokies this year? On the whole, basically everything. We’re shooting well, making our free-throws, not making silly mistakes (or at least as many as past seasons), and scoring off transitions. We have this guy, Erick Green, who is an offensive monster. He’s the second leading scorer in the nation. Green has scored 20+ points in all eight games so far this season. Look how happy he looks after beating OKST. I’d be that happy if I scored 28 points, too. Aside from crazy scoring, he knows how to run a point, and he isn’t afraid to drive. He trusts his teammates, and they trust him. Then we have this dude Jarrell Eddie. Guess what his 3-point percentage is. 51%. Enough said. 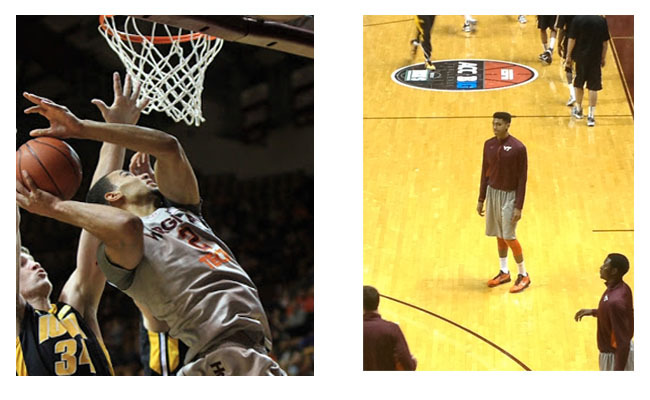 Two new faces to the Hokies this year are Marshall Wood and Joey Van Zegeren, who Kevin and I have affectionately nicknamed “Flattop” and “Dutchie,” respectively. These guys are tall and great to have under the basket to grab some boards. Wood is a solid outside shooter, and Van Zegeren has been great at muscling up some shots from right under the basket. Wood (right), photo courtesy of me. The only places I’ve seen trouble with us in up the middle and under the basket when the other team is on offense. We struggled with that against Oklahoma State and West Virginia. We have a habit of leaving the middle open and letting the other team score easily. Solution? Cadarian Raines. He’s huge. Keep him in the middle as a wall, and have fun getting over or past him. He’s also good at under-the-basket shots, too, like Dutchie. In past seasons, rebounds were our demise. Rebounds, both offensive and defensive, are essential to winning games. The less rebounds we grab, the more chances we give the other team to score. We have improved with rebounding, I think, but there is always room for more growth. Even though we were handed our first loss this weekend to West Virginia, the Hokies are still 7-1, and I could not be more proud. A loss was coming eventually, but I’m glad it came before ACC play begins. We fought hard at WVU, and proved that we have what it takes to play within the conference and put up a good showing. I am so excited for ACC play to begin in January, especially for that team from Durham to come back to Blacksburg so we can show them what we’re made of this year. And I really want to chant “Who’s your daddy?” at Seth Curry again. It’s barely the beginning of November, and I am already feeling the onset of winter. 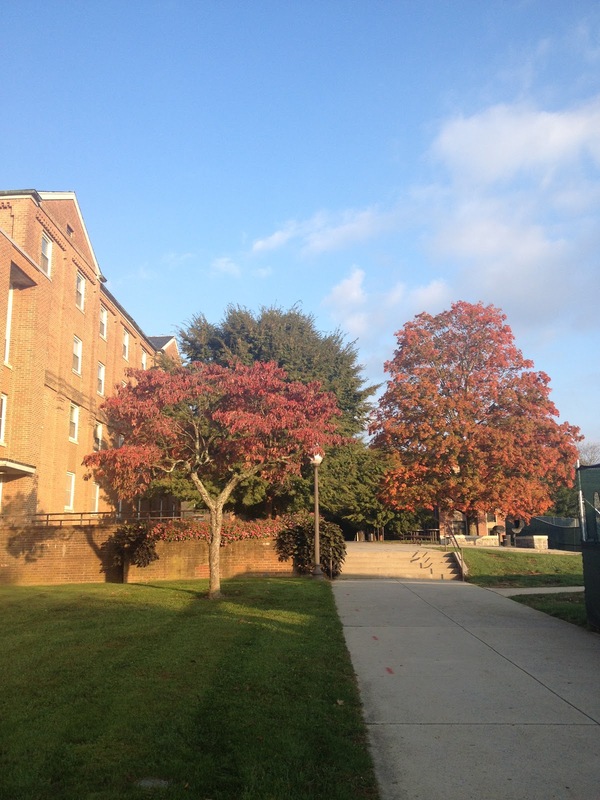 Blacksburg’s weather is usually unpredictable, but this kind of weather this early is crazy. Hurricane Sandy definitely kept us on our toes. Snow and 30-degree temperatures are not typical quite yet, anywhere, not just in Blacksburg. I’m not a fan of winter; I never have been. I don’t handle cold very well, or even at all. I’m (originally) from the south…cold isn’t my cup of tea. However, there are some things I do enjoy about wintertime that don’t involve throwing snowballs or playing on ice. So with that said, enjoy my Good, Bad, and Ugly of wintertime! Comfort Food and Beverages: Macaroni and cheese. Soup. Nachos. Casseroles. Anything hot and filling that will thaw me out after a cold day. My favorite of these has to be mac and cheese, or just about any other pasta-based dish. And who can forget hot cocoa, coffee, apple cider, and tea? I’m a huge fan of coffee, as I’ve said several times before, and I also enjoy some good cocoa every now and then. But really, what more do you need after a long, cold, windy day than a bowl of gooey pasta and steaming cup of coffee? Not much, that’s for sure. P.S. 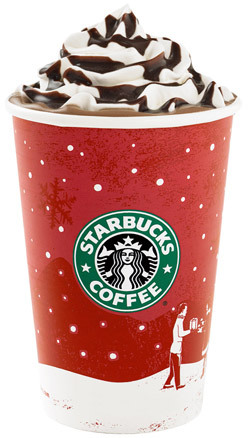 favorite winter drink: Starbucks’s Peppermint White Hot Chocolate. Talk about delicious. Definitely worth the calories. Snuggle Weather: If you don’t like to snuggle, you’re lying. Cold winter days are the perfect times to wrap up in a blanket with a loved one–parent, child, boyfriend, girlfriend, or even your pet…I know my cat loves my fleece quilts. But seriously, grab a blanket, company of some sort, and a movie. This could make for a great date when the weather is gross and you don’t want to go out! The Holidays: Need I say much more? With Christmas and New Year’s in my family, and Valentine’s Day later in February, winter is loaded with special days. The winter holidays are a special time of year for every family, no matter which ones you celebrate. Scarves (and other cute winter accessories): I usually don’t get into fashion too much, but I love scarves. They’re just fun and convenient, and you can find one in any color, any material, any weight, any design that will go with almost any outfit you put together. I have a collection of scarves myself, in at least five different colors. My favorite happens to be a maroon, black, and white plaid I got at Forever 21 a couple years ago for $5. Lucky find, and I love it. I also have a thing for gloves. 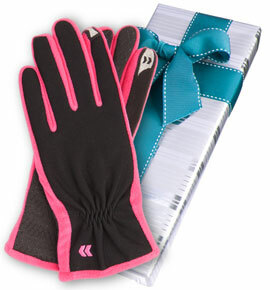 My hands are the first part of my body to go cold, so I am rarely without a pair of gloves. They recently came out with these gloves that have little sensor pads on the fingertips so you can still use touchscreens with your gloves…like those on the right. My mom bought me a pair, and they are wonderful. I highly recommend them for anyone who uses a touchscreen device. Gray landscape: Let’s be honest, winter isn’t always pretty. There’s just no color except brown and gray and white, and the occasional cardinal. Yeah, snow can be pretty when it’s falling, and sometimes the landscapes are nice to look at, but I’d rather see some color and flowers. I’m always more than happy when spring comes back. Cold: I hate cold weather. I was born in North Carolina and grew up in Atlanta. “Cold” in the South for most people is mid-40s, but for me, since I’m cold-natured, is about ten degrees above that. It’s just not fun being cold. The only silver lining I can find about cold weather is that I get to wear sweaters, scarves, and my fuzzy boots. Aside from that, being cold is overrated and uncomfortable. Winter Break from College: Okay, so it’s nice to have a break from the homework and studying, and I’m always happy to spend time with my family. But a whole month away from the college life? I think we can all agree that it gets boring quickly. I constantly have to keep myself entertained with movies, crafty stuff, cooking/baking, reading…anything. And even with all of that, I still get bored. I hope this winter break will be more exciting, mostly because I’m seeing Yellowcard in January! There’s one thing I’ll have to do. Yay! Monster Storms: This year, we had Hurricane Sandy, which turned into Superstorm Sandy, which struck the East Coast last week. The northern states got hammered with rain and wind, and down here in Blacksburg, we got a dusting of snow and some nasty winds. I remember a few years ago when we got about five feet of snow within a week in February. My parents and I spent way more than our fair share of time clearing our driveway just to be able to get out and go to the grocery store! We had walls of snow at least five feet tall surrounding our driveway…maybe even taller! That was a nasty winter, and I’ve certainly seen my fair share of them. Storms also affect traffic patterns and driving habits. You’ve got to be super careful on the roads, and be mindful of the conditions, in snow or rain. Accidents are everywhere and occur when you least expect them. I always drive at least 5-10 mph below the speed limit when it’s raining or snowing, and sometimes even more depending on how hard it’s raining or snowing. It’s a good rule of thumb, and it has worked for me since I started driving. I cannot stress enough…drive carefully in the snow, and always adjust to the conditions! Getting Rid of the Weight Gained from the Comfort/Holiday Foods: Between Thanksgiving and Christmas/New Year’s, the food is endless, and it’s delicious. We eat and eat and eat until we think we can’t eat anymore…and then we keep going. I’ve told myself for the past few years that I’m going to be more mindful of what and how much I eat during the holidays, but it’s the holidays, let’s be real. I’d be lying if I said one of my New Year’s resolutions isn’t always, “I’m going to eat less, be healthier,” and things of the like. Getting rid of the holiday pounds is absolutely miserable, no matter how in shape you already are. I run and work out, and I usually enjoy going to the gym, but I hate going for the few weeks after the holidays end. Maybe this year, I’ll actually stick to my resolution. I guess I’ll find out in January. And the one thing I cannot fairly assign to one category: SNOW. I don’t like snow, but I don’t dislike it, either. I guess I can say I don’t mind it in small amounts. It’s pretty when it falls softly and dusts the trees and such, but any more than a few inches, and I’m out. As a kid when we lived in North Carolina and Georgia, snow was such a rare occurrence that we cherished it whenever the opportunity arose. In Atlanta, one mention of snow sends the city into panic, and schools close in a heartbeat. But in Pennsylvania, it’s very different. Four feet of snow is an annual expectation…sometimes all from one system. After living on a gravel road and going through six winters in Pennsylvania, I see what happens to snow when it melts. It’s disgusting. Gravel and dirt and melting snow is not my idea of pleasant. It tears up our road, makes our cars gross, and just doesn’t look nice. And as mentioned above, I don’t like driving in it. I guess I have mixed feelings about winter. I hate being cold and snow isn’t my friend, but I love the winter clothes, comfort food, and any excuse to wrap up in a blanket. And I guess I can learn to face the post-holidays gym sessions. On the bright side, spring is really pretty, and serves as a nice relief from the miseries of winter. 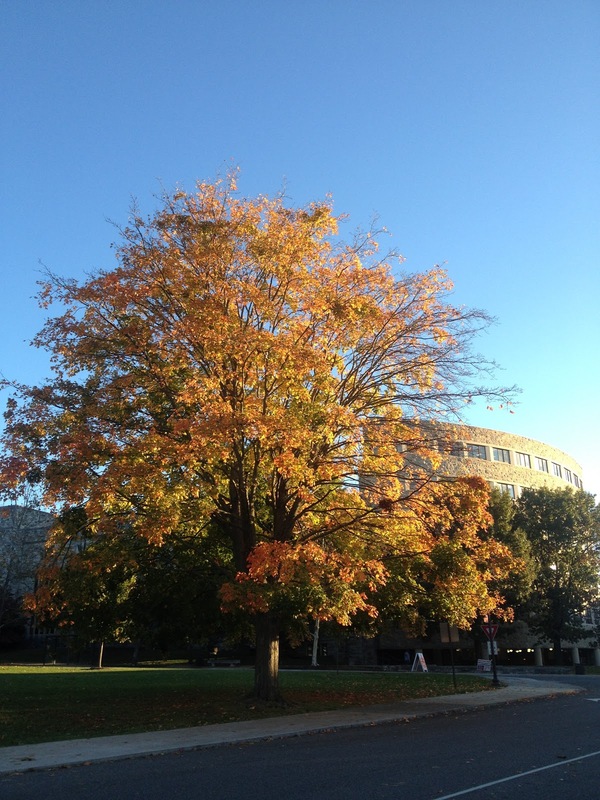 There are a hundred and one things to love about fall. 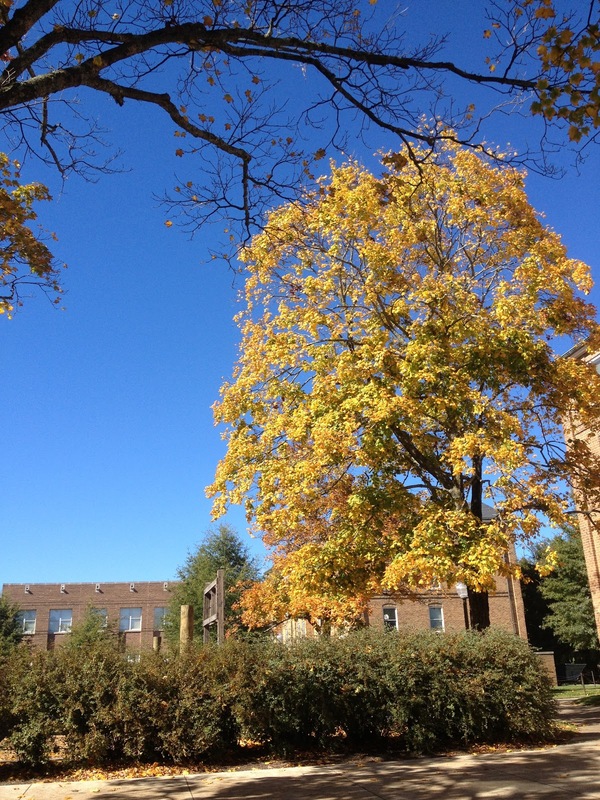 The colors, the weather, the sweaters, football…you name it. 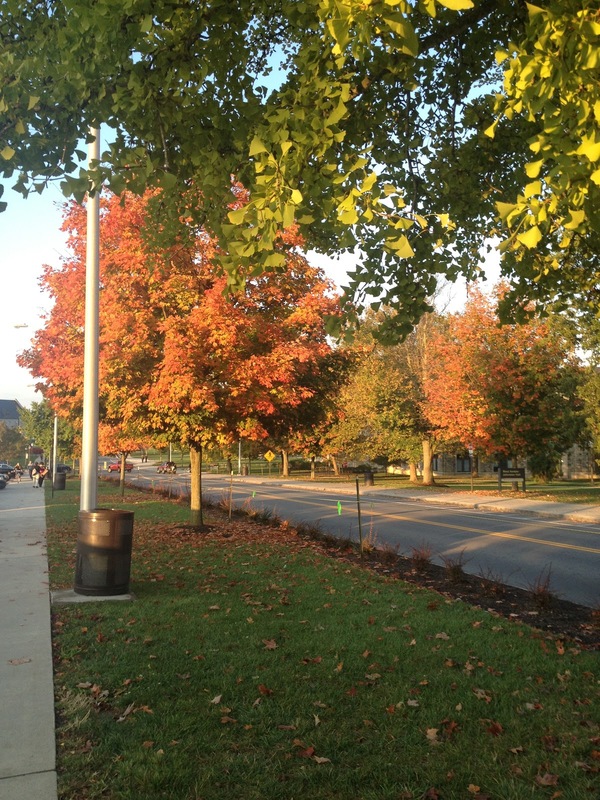 Fall is a wonderful time of year, for more than just the weather, clothes, and sports. I love the colors, weather, sweaters, and football (and the start of basketball season), but my favorite thing about fall is the seasonal food. The coffee shop on campus has Pumpkin Spice as its flavor of the month, and the Au Bon Pain has pumpkin muffins. Goodbye, meal plan. Sure, you can have pumpkin foods all year, I suppose, but they’re best in the fall; same with apple. Unfortunately, I haven’t made any pumpkin foods myself quite yet, but that will come. For now, I would like to share a couple favorites, a homemade version of a healthy snack, and my new favorite drink…second to coffee, that is. The first food I will share isn’t necessarily a “fall” food, but I just made it tonight and I haven’t written about it yet. My mom makes it at home a lot, and I love it on a sandwich or just on some Ritz crackers. This magical food is pimiento cheese. You can make it with any “harder” cheese…I doubt mozzarella or havarti or anything like that would work because they don’t grate very easily. I use cheddar; anywhere from mild to sharp, white or orange works just fine. To make this, grate your cheese; I use one 8-oz. block of sharp cheddar, which is plenty for me. Mix this with a whopping spoonful of mayonaise and a capful of apple cider vinegar. And then the chief ingredient, about half of a small jar of diced pimiento peppers. Mix this all up until it is thick. If you feel like there is too much mayo, add more cheese. You can eat it as soon as it’s made, which is what usually ends up happening with me, or you can chill it for a couple hours and let it come together. Either way, it is delicious, especially in a grilled cheese sandwich, or atop a hamburger. My grandparents have several pecan trees on their property, and every year they get about 30 pounds of pecans. My grandpa makes pecan pie, but my mom and I keep it simple and spice them up, literally. Spiced pecans are delicious, an addicting snack, and are really easy to make. In a sautee pan, toss a handful or two (or three) of pecans in butter, brown sugar, cinnamon, and nutmeg. Let it simmer for about five minutes, and then remove from heat and cool. See? Easy. I made a batch tonight, and I’ll be shocked if they last me through tomorrow. Applesauce was one of my favorite lunchbox snacks, and I still enjoy it every now and then. I stumbled upon a recipe for crock pot applesauce on Pinterest, and I had to try it. I was surprised at how simple it was, and it made enough to last me a week. I used a mix of about 15 apples: predominantly small fujis and galas, with a couple larger granny smiths thrown in for a sour twist. Peel, core, and chop the apples, and put them in a lightly greased crock pot. Add cinnamon and brown sugar, stir, and cover, and cook on low for about 6 hours. I uncovered and stirred once every hour or two, just to mix it around, and to let the smell fill my apartment. And I’m telling you, that is an incredible smell. The finished product is delicious served hot or cold. And finally…my new favorite drink, and believe it or not, it’s mostly caffeine free! I’ve discovered my love for ginger ale, but I can’t seem to drink it plain. When we stopped in Victoria, BC this summer, I ordered a Shirley Temple at dinner, it was made with ginger ale and orange juice. I wasn’t expecting to enjoy it as much as I did, and I have made it for myself again and again. But even better than orange juice is cranberry juice mixed with ginger ale. I must drink three tumblers of it every day. It’s a nice balance of tart, tangy, and sweet-ish, and a nice fall beverage. And with all of that…happy eating, and happy fall! Hello blog world…I’ve been slightly inactive for a couple weeks. College life is super busy, and I just haven’t had a whole lot to blog about. But now I do! I really love having a full kitchen in my apartment. It’s so convenient, and I’ve been exploring my culinary talents. Fortunately, I’ve had more success than failure in the kitchen, but I’m sure I’ll get confident and try something way out of my league. Thus far, my favorite thing to cook is pasta. My mom makes delicious mac and cheese at home; it’s one of the home foods I miss the most. I asked her to send me her recipe* so I could attempt to do it myself. My rendition was good, but nowhere near as good as Mom’s. Tonight, I was in a pasta-cooking mood, but I didn’t want regular mac and cheese. Using my mom’s recipe as a base, I created my own pasta dish. And it was delicious, if I do say so myself. You can make this dish wish pretty much any kind of pasta you like, except maybe spaghetti or something like that. Tonight, I used bow tie, but I’m sure shells, elbows, penne, rotini, or pretty much anything else would be fine. I boiled about half of the box, which was plenty for me, and will provide leftovers for the next week. The sauce is probably the most complicated part of this dish, but that’s not saying much since it’s pretty easy. Melt one 8-oz block of cream cheese with a handful of Italian cheese blend, a splash of milk, and a spoonful of pesto. I bought the pesto at the grocery store, but you can certainly make it yourself! It’s a thick sauce, so for a thinner consistency, add more milk. Soon enough, I’m going to have to learn to cook some things other than pasta. But for now, I’m pretty proud of my creation. Try it yourself, and maybe add your own twist to it. * For my mom’s traditional mac and cheese, use elbow macaroni, and make a sauce out of cheddar and milk. The rest is the same. 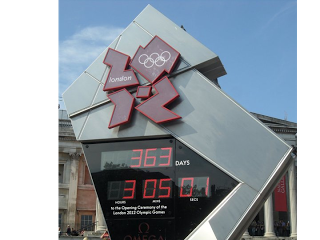 This weekend has been full of excitement, beginning Friday night with the Opening Ceremonies of the London Olympics. 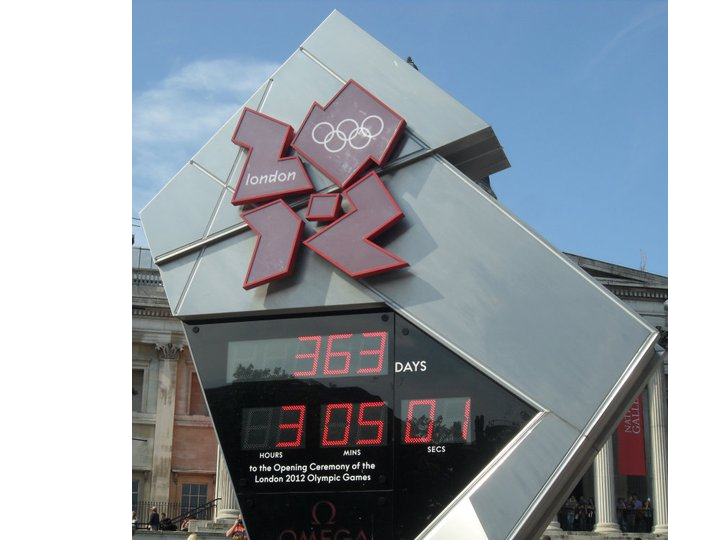 Like everyone else, I love the Olympics, and have been looking forward to the Summer Games all year. I’m reminded of March Madness in a way: any time I turn on my TV, there’s an exciting event to watch! It’s always fun to watch my favorite sports–tennis, track and field, gymnastics, and swimming, among others–and discovering new ones, like handball. But before all of the games can get underway, we must first enjoy the extravagant Opening Ceremonies. And London certainly gave us some interesting acts and sights that will be talked about for months. Before I go any further, it’s important to note that the British sense of humor is quite different from the American. That’s by no means a bad thing; I happen to understand, appreciate, and downright love British humor. It’s quirky, witty, and loaded with slapstick, which is a rare combination on this side of the pond. While there were some parts of the Ceremonies that I really wasn’t sure I liked, overall, I found them enjoyable, entertaining, and nothing short of dazzling. The Ceremonies were packed with British stars of all fame, from Kenneth Branagh to Rowan Atkinson, and from J.K. Rowling to Sir Paul McCartney. I laughed out loud when I saw Atkinson, aka Mr. Bean, seated behind the keyboard with the London Symphony Orchestra. Who would have guessed that? One of my first thoughts as I sat on my couch to watch the Ceremonies was if there would be any Harry Potter references made, and how they’d be done. As soon as the segment featuring British children’s literature began, I knew it was only a matter of time. And then J.K. Rowling appeared. And then suddenly there was a giant Voldemort, alongside the Queen of Hearts and Captain Hook. And then they were all defeated, not by hundreds of Harry Potters flying in on broomsticks, but by hundreds of Mary Poppins floating in on umbrellas. What a great display of British entertainment: not what spectators would have expected in the least. I guess a spoonful of sugar helps the Voldemort go down, too! Now the games are in full swing, with the U.S. already claiming eight medals (three gold, three silver, two bronze, as of today). I spent most of this afternoon watching the tennis matches; it’s like Wimbledon, part two! Of course I’d like to see the American men do well, I think it would be great for Andy Murray of Britain to take home the gold in men’s tennis. He came so close at Wimbledon earlier this month. You can bet he’ll be playing the best tennis of his life here! I was super impressed with swimmer Ryan Lochte’s performance in the 400 IM on the first night. Misty May-Treanor and Kerry Walsh-Jennings are already on fire, taking out Australian pair Natalie Cook and Tamsin Hinchley in beach volleyball. They are amazing to watch, too! What I look forward to the most, though, are gymnastics and track and field. The American women’s gymnastics team is absolutely explosive this year, and I can’t wait to see them in action. Track and field completely engages me, especially pole-vaulting and the high jump. All I can say now is, GO TEAM USA! Switching gears completely… my family is very into theater and plays, especially musicals. We’ve seen oodles of Broadway plays on tour over the years, including Phantom of the Opera, Grease, 42nd Street, Hairspray, Wicked, and several others. One of our favorites is Beauty and the Beast. We saw it in Chattanooga when I was in elementary school, and when we heard it would be making a stop in Hershey, we got tickets for this past Saturday’s matinee. As it turns out, Hershey is a much easier trip than Philly, even though Philly is a little closer. The drive is easier, and we don’t have to park in a sketchy parking garage and walk down crowded city streets. The Hershey Theater reminds me a lot of the Fox Theater in Atlanta. It’s small, but beautiful and comfortable. I loved Beauty and the Beast when I was younger, and Saturday’s show was no different. The costuming is so well done; Lumiere really looked like a candlestick! My favorite characters were Gaston and LeFou, by far. Gaston is an interesting and complex character with such an egotistical personality…it takes quite a talented actor to play him, and do it well. The actor we saw did just that. He was perfect, and he played off LeFou so well. My favorite scenes and songs are, in order: “If I Can’t Love Her,” “Human Again,” and of course “Be Our Guest.” That’s not to say I don’t like the other numbers…I just like these the most. “If I Can’t Love Her” is just so touching and beautiful; I may or may not have sniffled a little as the Beast realized he truly loved Belle, but she would never love him. “Human Again” was finally added to the Disney movie the last time it was remastered and re-released, which made me very happy. And who doesn’t love “Be Our Guest”? It’s such a fun scene! Speaking of fun scenes, the “Gaston” number has a new dance addition since I last saw this play in Chattanooga. It’s really neat: Gaston, LeFou, and the ensemble do a routine involving clanking their beer cans in rhythm with the music and choreography. It’s hard to describe, except it was so cool! Between the Opening Ceremonies and Beauty and the Beast, it’s been an entertaining weekend. Go Team USA! Up right now: Jen Kessy and April Ross in beach volleyball!